Cultural critic Fredric Jameson, renowned for his incisive studies of the passage of modernism to postmodernism, returns to the movement that dramatically broke with all tradition in search of progress for the first time since his acclaimed A Singular Modernity . 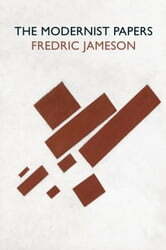 The Modernist Papers is a tour de froce of anlysis and criticism, in which Jameson brings his dynamic and acute thought to bear on the modernist literature of the nineteenth and twentieth centuries. Jameson discusses modernist poetics, including intensive discussions of the work of Baudelaire, Rimbaud, Mallarmé, Wallace Stevens, Joyce, Proust, and Thomas Mann. He explores the peculiarties of the American literary field, taking in William Carlos Williams and the American epic, and examines the language theories of Gertrude Stein. Refusing to see modernism as simply a Western phenomenon he also pays close attention to its Japanese expression; while the complexities of a late modernist representation of twentieth-century politics are articulated in a concluding section on Peter Weiss’s novel The Aesthetics of Resistance. Challenging our previous understanding of the literature of this pperiod, this monumental work will come to be regarded as the classic study of modernism.